"The entire company is working towards a single goal"
Stefan Weckbach, Head of BEV at Porsche (Battery Electric Vehicles) on e-mobility strategies, the development efforts of the sports car manufacturer and the search for future mobility's sound and soul. 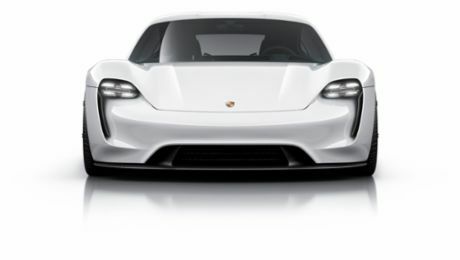 Mr Weckbach, as well as expanding the hybrid vehicle classes, Porsche now wants to introduce a purely electric vehicle based on the Mission E concept study. What strategy is the company following? A very clear one: we’ve been working on electrification of the powertrain for many years, always keeping our eye on the goal of leveraging the strengths of this concept for the benefit of our customers. We’ve been offering plug-in hybrids for the Cayenne and Panamera model lines for several years, and have continually optimised their power and electric range. The 918 Spyder showed the world that hybridisation can be a success in the super sports car segment, and we’ve chalked up big wins in racing sport with the 919 Hybrid in the LMP1 class. Electrification has therefore been an integral part of our development and product strategy for many years. Is that also because of new environmental legislation? It goes without saying that reducing CO2 emissions is one of the goals pursued by Porsche – and by that I mean the company as a whole – with its electric powertrains. However, “intelligent performance”, the smart use of new technology to boost performance yet further, is also a key consideration for Porsche as a brand and its customers. It’s particularly important in the context of our decision to embark on the series production of a fully electric model line – the Mission E – which we’ve announced for the end of the decade. When was this decision taken? …which is right here on the table in front of us. …and hanging on the wall behind me. I find it hugely motivating to be surrounded by Mission E vehicles! What is the difference between the Mission E and other electrically powered sports cars at the project stage in various countries around the world, for example in the USA or the United Kingdom? It’s different because it’s a Porsche. The Mission E combines the sportiness and everyday usability typical of Porsche while showing the world what we think a purely electric future might look like for four-door sports cars. We’re building on our brand values and aiming to ensure that our purely battery-powered vehicles can still deliver on the promises customers are already familiar with from our conventionally powered vehicles. As well as being quick to drive, our vehicles will also be quick to charge. The 800 V architecture enables the vehicle weight and package to be optimised, and also means that it takes less than 20 minutes to charge the vehicle for a journey of around 400 kilometres. One of the US-based manufacturers boasts that its vehicle can manage 0-100 km/h in under three seconds. But only twice – the third attempt will fail. The system is throttled. Porsche drivers won’t need to worry about anything like that happening. The Mission E will offer reproducible performance and a top speed which can be maintained for long periods. And that’s not all. The longitudinal and lateral dynamics of the Mission E will be typical of a Porsche and represent a real treat for any driver. The design. Just look at the model on the table in front of us – the series-production vehicle will have a very similar appearance. It’s apparent at first glance that this is a Porsche, and a vehicle developed with an eye to the future. What’s under the bonnet - just a luggage compartment? Lots of high-tech gear – the electric motor, the power electronics, the cooling system and other high-voltage components which sit in the front end of the car. But even with all of that, there’s still 100 litres of space for luggage. The very flat “nose” is more than just purely a design feature. Unlike the cameras used as exterior mirrors on the concept vehicle? The legislation currently in force would make it impossible to offer such a thing around the world in a series-production vehicle. We’ve also had to make other changes to the concept vehicle – some structural, some functional –to prepare it for series production. But the car and the Mission E are surprisingly similar. We recently showed the design-level vehicle to a small group of testers, who were all wowed. And how does it drive? It’s a fantastic drive – and I should know, because recently I had the opportunity to drive the first few laps in the prototype with our developers at the Idiada test track. Our vehicle is a four-door sport saloon that can carry up to five people, with a very low centre of gravity thanks to the underfloor battery and all possible refinements to the chassis. Driving performance combined with driving pleasure – everyone is in for quite a surprise. But the most fascinating thing about this project has been the team spirit and enthusiasm which has infected the entire organisation. The entire company is working towards a single goal: with Mission E, we will offer a fully electric Porsche which is a perfect fit for our brand, finds approval with our customers and rightfully bears the name “Porsche”. Was quick charging a feature of the Mission E concept vehicle from the very start? We decided on an 800 V architecture for the vehicle at a very early stage; this was necessary to achieve charging times of less than 20 minutes for a range of 400 kilometres so that the vehicle would be suitable for holidays and long distances. But you weren’t planning from the outset to install the relevant charging stations yourself? We were naturally hoping that the political climate might lend some momentum to charging infrastructure expansions, in Germany for example. The Volkswagen Group, together with other OEMs, has now founded a consortium aimed at building strategic charging points throughout Europe. In the USA, the Volkswagen Group will tackle this task on its own. The creation of an adequate charging infrastructure is a matter of urgency for gaining public acceptance of the technology. And to put an end to the widespread confusion over billing arrangements at different charging stations? Of course. The situation today is far from ideal. Our goal is for customers to be able to “plug and charge”; all they should need to do at a CCS station is to plug in their vehicle. After a cup of coffee and a 20-minute break, they’ll be ready to drive another 400 kilometres. What about a package which includes flat-rate charging? We need to do more research into what our customers really want, and we’re currently investigating various options and packages. There might be market demand for flat-rate charging from customers who are heading off on holiday, for example. The other companies within the Volkswagen Group are also expanding their range of e-vehicles. To what extent are you cooperating? E-mobility is a Herculean task, and that’s also true in monetary terms. Group-wide cooperation is therefore a huge plus for us. What does that look like exactly? We’re working very closely with our counterparts, in particular at Audi, on the use of joint modules for the e-vehicles we are currently planning. The brands are also working on the joint development of a platform for new BEV projects in the future. Will this mean that every brand can build its own “Porsche”? Not at all. That’s not what anyone wants. Instead, what the group wants is to work together to make a greater impact without losing sight of the things which differentiate us. A Porsche will always be one of a kind. We’ve already successfully demonstrated that during other joint projects in relation to combustion engines. The balancing act between sportiness and everyday usability, our commitment to quality and our distinctive design features, such as the Porsche flyline or the “head-on-shoulders” appearance – all these things are and will always remain the essence of Porsche. A Porsche is simply unmistakable, whether by day or by night. Just think about the four-point headlights. 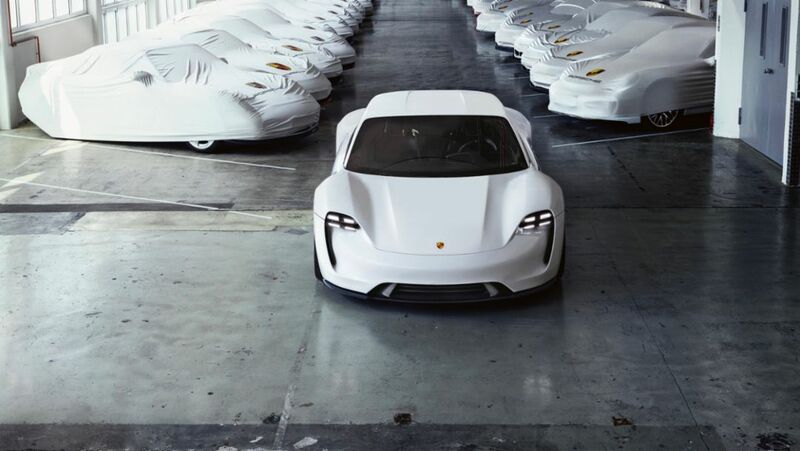 As a manufacturer of sports vehicles, Porsche has to take into account special customer requirements during the electrification of its products. How would you define the Porsche USP? Our ambition is always to offer the sportiest vehicle in the segment: a compact, attractive design and a high level of performance combined with everyday usability. That is the soul of Porsche. And that soul will also be embodied in our electric sport saloon. We try to take advantage of the opportunities presented by the placement of the battery modules in the underbody. We’ve designed the structure in such a way that the rear passengers can place their feet in a recessed section of the battery block. This means that the car has a flatter design, with the sloping roof line which is typical of Porsche. And an optimum centre of gravity. Won’t Porsche drivers miss the sound of a conventional engine in an e-vehicle? It’s true that our sports exhaust systems have been a huge sales hit in the current market for combustion engines. It’s also true that they’ll be missing in the Porsche e-vehicle. One option would be to pipe the sound of the engine through the loudspeakers. A demonstration e-vehicle from France even played “La Marseillaise” when accelerating. Porsche is unlikely to lower itself to gimmicks of this kind or use sound effects to mimic a bubbling eight-cylinder. But we will give due consideration to sound as an emotional factor in the Mission E, using the design approach typical of Porsche and incorporating a clear reference to the technology. Let’s talk again about the Porsche feeling. Aren’t you worried that the typical Porsche experience will be lost if assistance systems and digital services do too much of the work for e-vehicle drivers? Porsche drivers want to drive. They don’t want their vehicles to do the job for them. That is the unmistakeable outcome of all our discussions with customers. But I don’t think that goes against what we’re trying to do. First and foremost because no one believes that cars will be able to drive themselves completely in the short or medium term. And as I said, that’s not what Porsche customers want anyway. They want their cars to do the boring jobs which are no fun for anyone. …inching along in a traffic jam or looking for a parking space, for example. Exactly, no one objects to autonomous driver-assistance systems intervening in situations like that. And many drivers make frequent use of the speed-sensitive automatic cruise control function. We’re also working on apps which reinforce or support the typical driving experience in a Porsche. A good example is our current Track Precision app. It gamifies the improvement of lap times on a private race track. Let’s return to the topic of e-mobility: forecasts for the market penetration of e-vehicles very wildly, even among experts. That’s true. Automotive analysts are still at odds with each other on this question. By 2025, up to 25 percent of vehicles in developed markets might be electrically powered. This figure depends to a large extent on the wider context, however; the charging infrastructure, government funding or regulations and price trends for components, to name but a few factors. We’re ready for whatever comes our way. Do you have enough employees with the skills to work on electric powertrains and the digital transition? As I said, Porsche has been working on the electrification of its vehicles for many years, and so we’ve already grown our capacities in many of the relevant areas. But we’ve also followed a strategic policy of hiring staff with appropriate skill sets throughout all the departments. Our decision to build the Mission E in Zuffenhausen, at the Porsche headquarters, means that we’ll need to recruit well over 1,000 new production and development employees. These new recruits will need very different qualifications. They’ll be working on programming tasks and high-voltage equipment rather than piston strokes or dry sump lubrication. Porsche has always delivered high-voltage thrills! Seriously, though, a car is still a car in many respects. Regardless of the powertrain, many of the challenges remain the same. Exterior, interior, chassis, brakes and so on. This is where the body of Porsche expertise accumulated over decades comes into play. And our policy is to develop new electronic architectures, screens, head-up displays, over-the-air functions or digital services for all the model lines at once wherever reasonable, regardless of the powertrain type. So, do you already have a large team of programmers? In the midst of all the excitement about digitalisation, it’s important to remember that the products and services we offer must generate added value for our customers. We need to know what the customer needs and what we can provide in the way of added value. Developments such as increased networking and the need to handle vast amounts of data mean that our IT and programming teams are faced with ever greater challenges. Is everyone on board with this trend? The first point worth making is that the underlying ethos of our company, and of all of our employees, is to relish every challenge that comes along. Many of these challenges are ones which we have set ourselves, because our ambition is to get the best possible car for our customers onto the road. ...is that the entire company is looking forward to the Mission E. And the third point which follows on from this is that all of us – engineers, software developers, designers, salespeople and even finance experts – are quite clear about the fact that what we are doing here is creating a new world for Porsche. We’re developing the first all-electric Porsche which is capable of travelling long distances and which offers many other intriguing features. This car is electrifying. August Achleitner and Stefan Weckbach on sports car culture, electromobility and the Porsche brand. 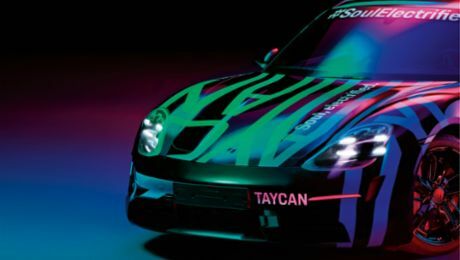 The first purely electrically powered sports car from Porsche, the Taycan, is enjoying significant attention worldwide. Wth Google, Porsche has developed an augmented reality app which shows the new Porsche Mission E.